A request for reconsideration for unemployment benefits is a is a type of appeal. Usually, this type of appeal is after a phone call with a judge. 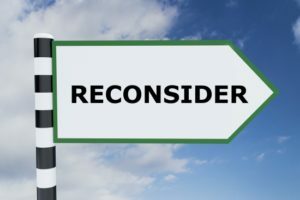 In Minnesota, employees and workers drafting or filing a reconsideration can outline errors an issues to support a reversal. As an unemployment lawyer, my goal is to educate and inspire a conversation with applicants seeking help for a matter of this kind. I believe the best way to handle a reconsideration is pinpointing a deadline, acquiring evidence, and outlining legal errors, lies and procedural issues. A MN reconsideration for unemployment benefits is generally governed by Minnesota unemployment statute 268.105. The process of appealing a denied unemployment claim and seeking a reversal requires filing a reconsideration. A favorable outcome usually includes references to MN laws or cases supporting eligibility and the payment of benefits. Thus, the following articles address this matter and I hope you contact me for one-on-one advisement. Why is the Unemployment Office Slow in Responding to my Appeal?